King Lear, in its monumental scale and overwhelming desolation, is a play that can defeat its audience. It continues to stand alone as the greatest of tragedies due to Shakespeare’s seamless transition from initial personal tragedy to something that contemplates human suffering at a universal level. It may be commonplace to reference the existential nature of the latter stages of King Lear but it is only within the last hundred years that the world has caught up with what Shakespeare was thinking when he wrote of Gloucester and Tom atop the cliff that never was or gave voice to the depths of Lear’s madness. That Shakespeare was writing a play set in the years before England had become England, taking his sources from the Middle Ages and developing interior thoughts that would only be given a name four hundred years later gives an idea of the totality of the play and its all-encompassing nature. Indeed our understanding of the importance of the play appears to be only increasing over time; as Jonathan Bate notes, King Lear it has been performed more times in the previous fifty years than in the preceding three hundred and fifty. Famously Samuel Johnson could not bring himself to re-read the play until forced into doing so by his role as an editor and even to audiences inured to a global world of senseless cruelty and terrible injustice, Shakespeare decision to move away from the original chronicles and deny his characters and his audience one final redemptive moment is both shocking and hard to bear. It is as if Shakespeare determined to summon up all the miseries of the world and present them in the most elegantly poetical language so that those listening could close their ears. To make matters worse this is not the tragedy of Euripides or Sophocles; events in Lear’s England do not hinge on the fickle nature of the gods, rather they are summoned into being by a mankind fully in control of their own destiny. Shakespeare repeatedly shows that in a world without divine intervention suffering falls, without mercy, upon the just and the unjust alike. As we see Lear crumble and Gloucester blinded Shakespeare refuses to relent and even uses Edgar, in the persona of Mad Tom, for a piece of audacious foreshadowing of the horrors to come. By telling the audience that ‘…the worst is not / so long as we can say ‘this is the worst’’ [IV.i] we can hardly claimed to not have been warned. Is it any wonder that for almost 150 years an alternative version in which the play ends with Cordelia marrying Edgar was the preferred version? What audience could countenance such grotesque horror without the possibility of redemption? There is so much contained within the play that the role of the director is absolutely central to any production of King Lear. If the director has in mind an actor then it is likely he has already determined how his Lear should be. Sam Mendes and Simon Russell Beale have a long and fertile history, and a production of this scale must have been on the cards for some time. One may argue that, at 53, Simon Russell Beale is too young to play Lear and one consequence is that makes the decision to pass his kingdom to the next generation seem even more short-sighted than usual. However the reverse of this is that there is always the tantalising prospect that he may one day return to the role with the wisdom of two further decades behind him. Mendes introduces us to Lear’s England with a striking opening image; the Olivier space dominated by what appears to be a huge solar eclipse. Other reviews have mentioned its similarity to the eye of Sauron in the Lord of Rings films and it is unlikely that Mendes, no stranger to cinema, missed this clear reference point. Yet the recognition of such a link may be no bad thing as it acts as a subtle primer for the obsession with eyes and sight that exists in King Lear and affixes the notion into the audience; we are to enter a world where even the sun can become blind, so what hope for mere humans. The image, reminiscent of a giant 0, can be seen to reflect Shakespeare’s repeated reference to ‘nothing’ within the text. In the opening scene Cordelia’s nothing, repeated by Lear as ‘nothing will come of nothing, speak again’ [I.i] begins this trend and we will later have Gloucester’s ‘This great world / Shall so wear out to naught’ [IV.vi]. Lear himself will find himself with nothing after having everything and Gloucester loss of sight is another form of encountering nothingness. King Lear is a world where people suffer the worst privations and are gradually reduced until almost nothing remains; Gloucester is stripped of his sight, Lear his mind, Edgar his status and the Fool and Cordelia, the two characters who perhaps exude the greatest moral worth, are stripped of their lives. Mendes has set the play in what is best thought of ‘classical modern’; it is a world of non-specificity that can exist as both England and not-England, and that without giving many overt signs points to a totalitarian state. Landscapes tend to be bare, colours muted and it is an understandable choice for a space like the Olivier, whose vastness tends to preclude more intimate settings. Anthony Ward’s production design does not need to work very hard but it includes some nice touches, such as the statue of Lear that takes centre stage and reinforces both the dictatorial nature of Lear and also the obsession that these leaders so often have with their size. Rather than try to hide Russell Beale’s relative small stature in a role that often calls for physical presence, it is a neat reminder that a powerful leader has other tools that can be used to establish their presence. For these positives it must also be noted that there is a jarring unevenness to this production. It is a fault of direction, as at times it struggles to deliver the narrative story, but it also rests in the performance by Russell Beale. When he is working in a register that is comfortable the play is often superb and he proves himself a deeply intelligent actor but there are a number of moments in the first half of the play where his performance suffers from a lack of tonality and he seems to struggle to find Lear’s raging depths. The strengths lie in the second half where he manages to summons comedy out of tragedy; Russell Beale’s ability in the tragi-comic range is unmatched and he can find humanity in the most pompous and self-important of characters. He is able to make us care for distinctly unlikeable characters brought low by circumstance, self-induced or otherwise. His Widmerpool in A Dance To The Music Of Time or his Falstaff in the BBC’s The Hollow Crown series are absurd yet very human creations; all arrogance and bluster that hide a deeper-rooted insecurity. In the later Acts of King Lear, he is tremendous at finding the pathos in a man who through his own action has brought a whole country to the brink of ruin, who believes that despite being a man who would willing cast out the daughter he loves and exile one of his core supporters he is still ‘a man/more sinn’d against than sinning [III.ii]. Shakespeare’s great scene between the blind Gloucester and the mad Lear is played to perfection and, as they sit, seemingly like ants, alone on the vast, empty Olivier stage, the cosmic absurdity of it all is brought crushingly home. It is here in the desolate emptiness that Russell Beale locates Lear’s humanity; his exchanges with Gloucester contain a splendid sardonic delivery, and show that Lear, whilst hovering on the edge of lucidity, is still capable of recognising his fall. ‘Oh let me kiss that hand’ ‘Let me wipe it first; it smells of mortality’…’I remember thine eyes well enough’ [IV.vi] is played beautifully and one would need a hard heart to not be touched by the sadness of Russell Beale’s inflection on ‘smells of mortality’ and to see and feel for a man who cannot quite comprehend how he has been brought down to a level that he has never experienced. In an instant we are lost in Lear’s ruminations and feel the recognisable tug of dementia on a man who in one moment is asking Gloucester to pull-off a non-existent boot and another displaying the dry wit of a man used to being surrounded by courtiers, ‘Get thee glass eyes; / And, like a scurvy politician, Seem / to see things that thou dost not’ [IV.vi]. 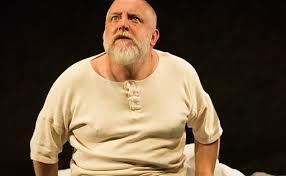 Throughout Russell Beale is ably supported by Stephen Boxer’s superb portrayal of Gloucester. It has been noted previously, most clearly by Jan Kott in his famous essay on Lear and Beckett, that Gloucester begins the play by seeming like a character out of time, appearing as a comic and slightly dandyish creation. This is made real in the very opening of the play where Boxer’s Gloucester jokes with Kent about his son’s bastardry in Edmund’s presence. Boxer excels with the slightly foppish air of the privileged, easily led to the wrong conclusions; his metaphorical blindness to the existing dangers seeming to inexorably lead to the horrific literal blindness. The fall of Gloucester and the suffering laid upon him outstrips that of Lear because it is so unexpected; there is an air of comeuppance that surrounds Lear but what happens to Gloucester seems completely out of keeping with what we would expect from his character arc. The brutality of his blinding and his eventual salvation through the cruellest of tricks is made even more painful for the stoic dignity that Boxer’s Gloucester exudes. The problems with Russell Beale’s performance mainly occur in the earlier scenes that handle his decline and the onset of madness. The skills that make his Lear so moving in the latter half of the play work against him in the first half. Whilst physical presence is not a prerequisite for a role, it becomes more problematic when the performance also lacks a vocal presence. He has never been the loudest of actors, his skill lies in his subtlety, and there are times when he is defeated by the sound effects. As a stage presence he often lacks the natural authority of Stanley Townsend’s Kent and this presents a problem because it raises the question of how Lear managed to get to and retain his position of authority. He does not immediately strike the audience as a man who would have maintained power over a fractured court, particularly if also undergoing a mental decline. The madness is more clearly evoked than in many versions and would appear to be reflected as a form of dementia. It is hinted at in the opening scene; as Goneril and Regan set out their love for him he applauds, clearly hearing what is expected but still taking a childish delight in it and there is clear petulance that goes further than simple displeasure in response to Cordelia’s ‘Nothing, my lord’[I.i]. He uses his authority to humiliate her; making her stand upon a chair as he chastises her before making the rash decision to cast her into the arms of the accepting King of France. The climax of his descent into madness is with the truly radical decision of Mendes to have Lear batter the Fool to death. This is a brave decision and one that does seem to work in the context of the play. It always seems strange that the Fool disappears from the play after previously being so pivotal and the move always carried with it the hint of dramatic necessity. With Russell Beale’s Lear moving in and out of lucidity, the idea that the false trial of Goneril and Regan acts as a trigger moment for an act of unrestrained violence is plausible. It also allows for the idea that, consciously aware of his actor not, with the death of the Fool, Lear loses his last anchor to reality. 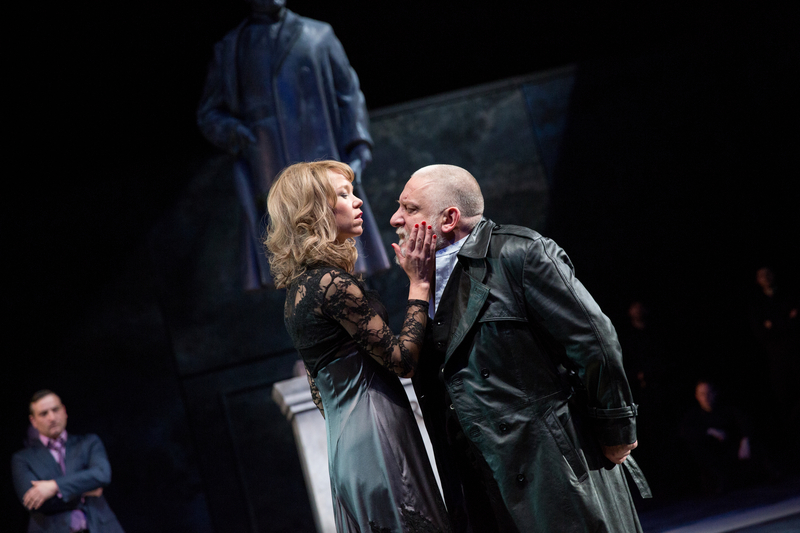 It is only the re-emergence of Cordelia in Act IV that sees Lear reconnect with reality; it is a touch that lends the reconciliation scene an extra level of beauty, as it hints at a theme that Mendes seems keen to reflect on – that underneath the pain, love can lead to salvation (For more on this see Matt Truman’s excellent review). It is the Fool and Cordelia’s love that can bring Lear towards sanity, and it is ultimately Edgar’s love for Gloucester that saves him. With love comes hope and Tom Brooke invests much into Edgar’s final lines of the play ‘we that are young shall never see so much, nor live so long’ [V.iii] to leave the audience with its own hope that from such pitiless destruction there is the possibility that those that remain can forge life anew. So rather than focus on the parts of the production that that do not quite work, let us instead focus on that thin sliver of hope in the midst of such unrelenting despair that Mendes has worked so hard to leave us with. What makes a great Lear?